While most fatalities occur on highways and in rural areas, more than 50 percent of all crashes in the United States occur at intersections. This is often due to the inherently unsafe nature of intersections, where multiple actions such as changing lanes and turning into the flow of traffic have high potential for car accidents and collisions. This trend holds true in Montana (to a slightly lesser degree), where intersection crashes make up more than 30 percent of all traffic collisions. 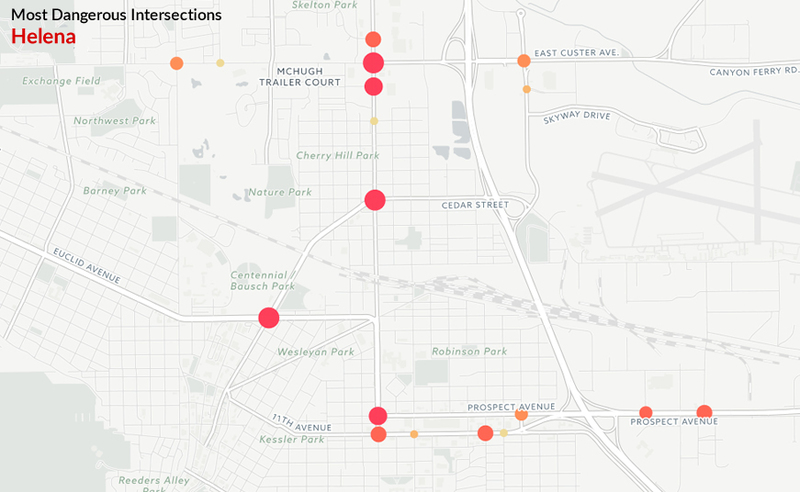 But which of the Treasure state’s intersections pose the highest risk to drivers? 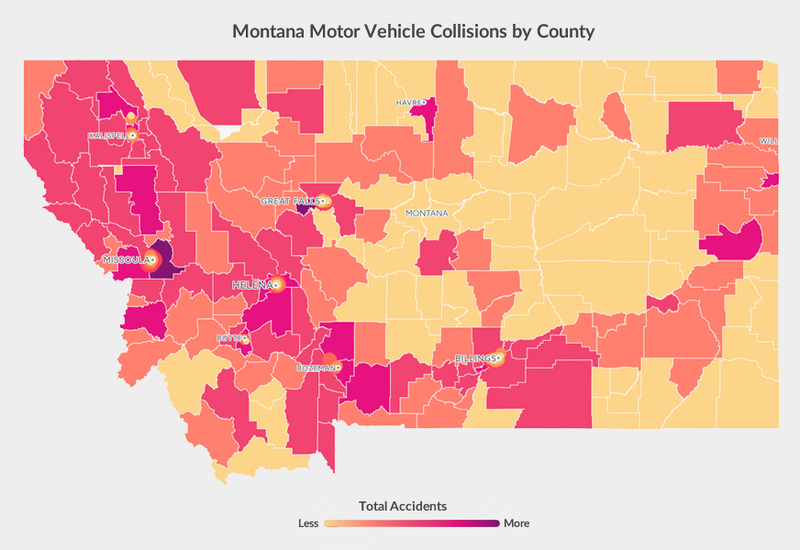 In order to find out, Heenan & Cook, PLLC worked with data visualization firm 1point21 Interactive, gathered all Montana crash data from 2014-2016 (66,711 crash records in all) and conducted a geospatial analysis. Through our efforts, we identified 163 high collision and high risk intersections through out the state. The 163 intersections we identified accounted for a total of 3,399 crashes resulting in 913 injuries. The intersection of North Reserve Street and Mullan Road in Missoula is the most dangerous intersection in Montana, with 121 crashes and 34 injuries. 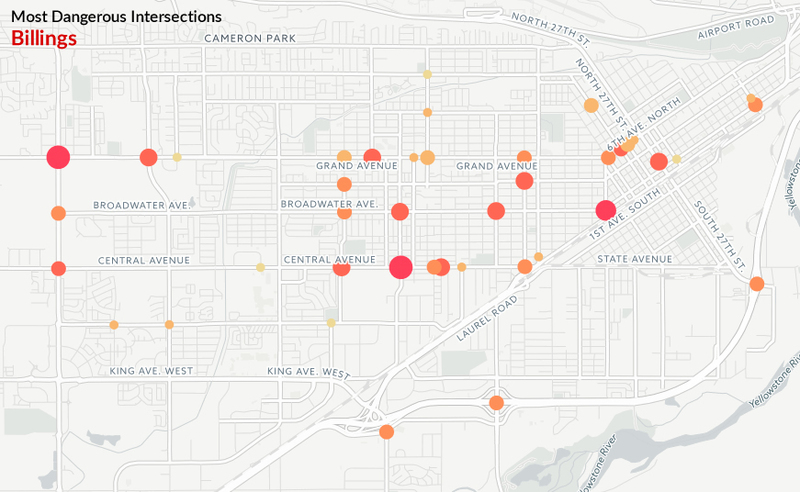 The five most dangerous intersections we identified were all in Missoula, four of them on Reserve Street. All in all, Missoula topped the list with 58 intersections – roughly 36% of all listed intersections. Although Billings is the most populous city in Montana, it was second on our list, accounting for 26% of listed intersections. Interestingly, of the 163 high risk intersections, none of the crashes resulted in any fatalities. As we mentioned previously, fatal collisions occur much more often on rural roads and highways. In Montana, rural roads make up 89 percent of all roadway fatalities due to the state’s lower population density and rural centered population. The intersections we identified however, expose drivers to a higher risk of collision and potential injury. 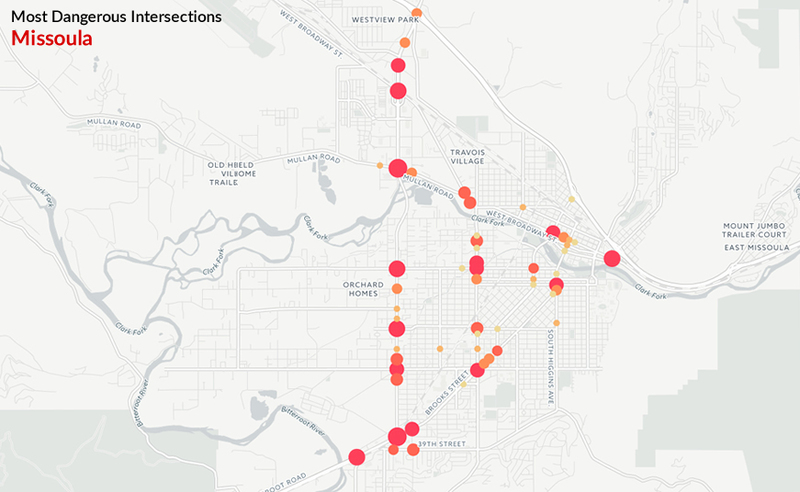 The crash-prone intersections found in these Missoula, Billings, Great Falls, and Helena account for about 88% of the listed intersections. Missoula topped the list with 1426 crashes and 381 injuries occurring across 58 intersections – roughly 36% of all listed intersections. The second largest city in Montana, Missoula houses about 72,000 residents, and contains some of the busiest intersections in the entire state. In fact, the intersection of Reserve Street and Mullan Road takes the top spot on our list, with a whopping 131 crashes from 2014-2016. According to the Montana Department of Transportation, it’s easy to see why: in 2015, this intersection was dubbed the busiest spot in Montana, with an average of 47,810 vehicles driving through it daily. Reserve Street in general is an incredibly high-traffic major road that carries significant traffic through Missoula – and with higher traffic comes more chances of an accident. In fact, the road takes up four of the top five high crash intersections in Missoula. With a population of about 110,000, Billings is the largest city in Montana – the only city in the state to top 100,000 people. Despite being the largest city, Billings ranks second on our list, with 43 dangerous intersections accounting for 748 crashes and 228 injuries. The intersection at Grand Avenue and Shiloh Road tops the list. With 68 crashes, it has nearly 50% more collisions than the next highest intersection. Why is this? Shiloh Road and Grand Avenue are two of the most heavily traveled roads in Billings. As two of the main arterial roads cutting through the commercial and business sectors of Billings, both roads serve as primary corridors for traffic from cars and trucks alike. With studies predicting up to 40,000 vehicles traveling Shiloh Road every day by 2027, the Montana Department of Transportation reached a reasonable solution to relieve traffic on this corridor while simultaneously improving safety along the road: roundabouts for the most heavily-congested intersections along Shiloh Road. No traffic lights to beat. Because there’s a constant, circular flow of traffic, drivers no longer have to recklessly beat yellow lights to get to their destination on time. Low driving speeds. Drivers do not come to a full stop, and instead maintain a low, consistent speed through a roundabout. Although this may seem counter-productive to traffic flow, this constant movement actually shaves times off of commutes. One-way traffic. Everyone in a roundabout travels the same direction, in the same lanes. Therefore, there’s no chance of a driver getting T-boned or in a head-on collision. While the Grand & Shiloh intersection does have significantly more collisions than the rest of the Billings intersections from 2014-2016, this may be attributed to drivers’ general unfamiliarity with roundabouts. Additionally, it’s important to note that this roundabout is a net positive for driver safety – not only were there no fatalities, but roughly 93 percent of the collisions were non-injury crashes. The roundabout experiment in Billings is so successful that they have converted most of the high-traffic intersections on Shiloh Road into roundabouts, and started construction on a new roundabout on Grand Avenue just this summer. Additionally, other major cities in Montana are exploring the viability of installing roundabouts in their high-traffic roads. Montana’s former largest city recorded 458 total crashes across 26 intersections. Of note is the abundance of 10th Avenue intersections listed, accounting for 9 of 26 intersections, and total approximately 45 percent of all crashes in Great Falls. This is no surprise, as 10th Avenue is one of the major arterial roads that cuts through Great Falls. With multiple traffic light intersections, high amounts of traffic, and two-lane and single-lane roads often shared with semi-trucks, collisions may be inevitable. In fact, there were 128 crashes on 10th Avenue alone in the summer of 2016 – and in 2014, 10th Avenue was actually the second busiest street in the entire state of Montana. As a result, the Great Falls Police Department has taken the initiative, using “high visibility enforcement” to improve 10th Avenue – a tactic which uses proactive police enforcement and ticketing to serve as a deterrent. GFPD has seen some improvements in driver safety on the corridor, and only hope it continues to trend positively. Helena, the capital of Montana, rounds out this list. A relatively small city of about 31,100 people, Helena is actually the fifth least populated state capital in the United States. However, it has its fair share of danger, with 17 crash-prone intersections combining for 457 total crashes – only 1 crash less than Great Falls distributed across less intersections. 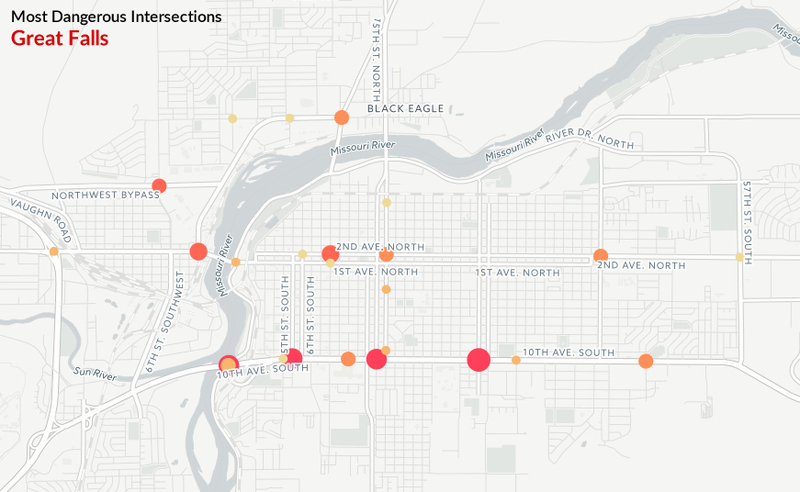 A good majority of the crashes occur in intersections along North Montana Avenue, the city’s biggest north-south urban corridor. In fact, this is the most heavily traveled road in Helena. According to the Montana Department of Transportation, the busiest intersection in Helena is the cross-street at W Custer Avenue and N Montana Avenue, with an annual average daily traffic of 23,648 drivers in 2016. According to our analysis, this intersection also ranks first in Helena crashes. 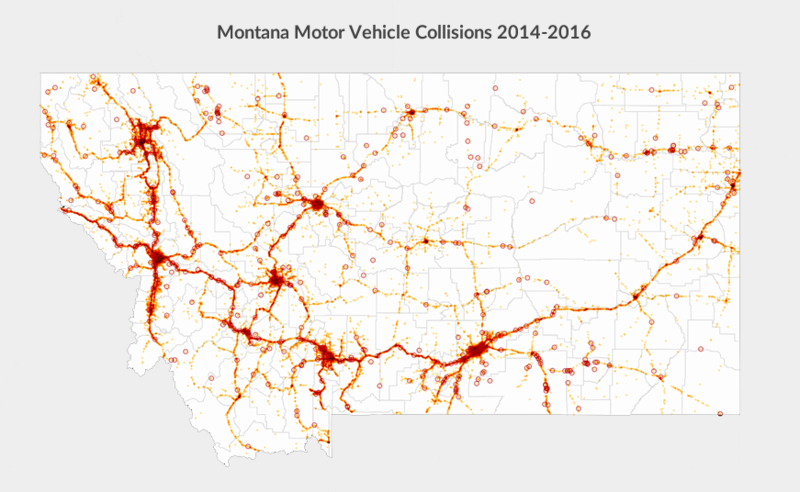 Collision data was obtained from the Montana Department of Transportation for the years of 2014-2016. Any collisions that occurred within 50 feet of an intersection were assigned to it. Collision severity was taken into account by weighting significant injury crashes more heavily than minor injury and property damage only crashes.